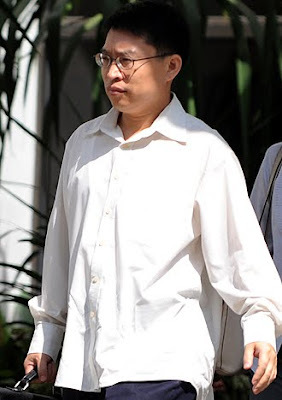 Sg Truth: Professor Li Jin Yan of NTU molested a student? If convicted, Li (above), who has a PhD in computer engineering, can be jailed for up to two years or fined or caned, or receive any combined sentence. -- ST PHOTO: AZIZ HUSSIN. I don't know about you guys, I touched the buttocks of thousand of people, male and female, while squeezing through crowded MRT trains every morning. How come nobody charge me in court yet? AN ASSOCIATE professor has been charged with molesting a 22-year-old student at Nanyang Technological University. Li Jinyan, 40, is accused of touching the left buttocks of the woman in a room at Block N4 on Sept 11 last year. He was charged a week ago and made his second appearance in court on Wednesday. His lawyer, Mr Gary Low, said he had just been briefed, and sought an adjournment to take instructions and make representations. If convicted, Li, who has a PhD in computer engineering, can be jailed for up to two years or fined or caned, or receive any combined sentence. A pre-trial conference is scheduled for May 10.